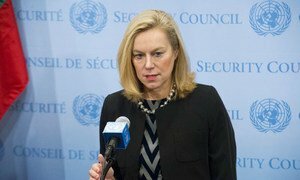 Special Coordinator of the Joint Mission of the OPCW and the UN Sigrid Kaag speaks to journalists following a closed-door meeting of the Security Council. The United Nations today welcomed a long-sought accord to let in convoys with life-saving supplies for 500 Syrian families trapped by war in the Old City of Homs without any aid for two years, but voiced growing concern at the slow pace in ridding the country of chemical weapons, calling for swifter action. But even with deadlines being pushed back several times in carrying out the agreement brokered by Russia and the United States under which Syria renounced its chemical weapons material and joined the 1992 Convention banning them, Secretary-General Ban Ki-moon voiced hope that the 30 June target date for completion would be met. At UN Headquarters in New York, the Security Council held consultations on the issue, noting the removal of “limited quantities” of chemical weapons material from Syria on 7 and 27 January by ship, but it voiced “growing concern at the slow pace” of their removal. The 15-member body called upon Syria to “expedite actions to meet its obligations to transport in a systematic and sufficiently accelerated manner all the relevant materials to Latakia… and to intensify its efforts to expedite in-country movement,” the Council President for February, Raimonda Murmokaite of Lithuania, told reporters afterwards. Under the agreement Syria was meant to remove all its most critical chemical weapons material to Latakia for destruction outside the country by 31 December of last year. Less critical elements are to be destroyed within the country, all by 30 June. The suffering of the 2,500 people besieged in Homs has become a symbol of the horrors inflicted upon civilians by the civil war in which considerably more than 100,000 people have been killed and millions of others driven from their homes since the conflict erupted in March 2011 when originally peaceful protestors sought the ouster of President Bashar al-Assad. Their plight represents to an extreme degree the lot of nearly 1.6 million civilians in other parts of Syria who have been without regular food or medical supplies for months, with UN aid agencies only a few miles away but unable to gain access from the warring parties. In the case of Homs, UN trucks have been on standby for weeks only 12 kilometres from the Old City, ready to deliver urgently needed food and medicines to the 500 families, but agreement has been lacking. Today, UN Emergency Relief Coordinator Valerie Amos welcomed the news of the so-called “humanitarian pause” that will allow civilians to leave the Old City and let in essential, life-saving supplies for about 2,500 people. “Now there must be unhindered, continuous and safe access for humanitarian workers to deliver aid to the millions of people trapped in all the hard to reach or besieged areas across Syria,” she said. According to the statement, the Secretary-General reiterated his condemnation of indiscriminate use of any weapon against civilians, in contravention of obligations under international law. “All civilians must be protected in any situation,” said the statement, underscoring that the Secretary-General also reiterates that further violence serves the agendas of those who see military means as the only way forward, at the expense of the Syrian people. Despite a delay in eliminating Syria’s chemical weapons material, the United Nations Security Council expects that there will be no delay beyond the end-of-June deadline for the total removal of all such materials, the head of the group charged with the effort said after briefing the 15-member body today.